EURUSD had a small growth yesterday but it started to fall today. 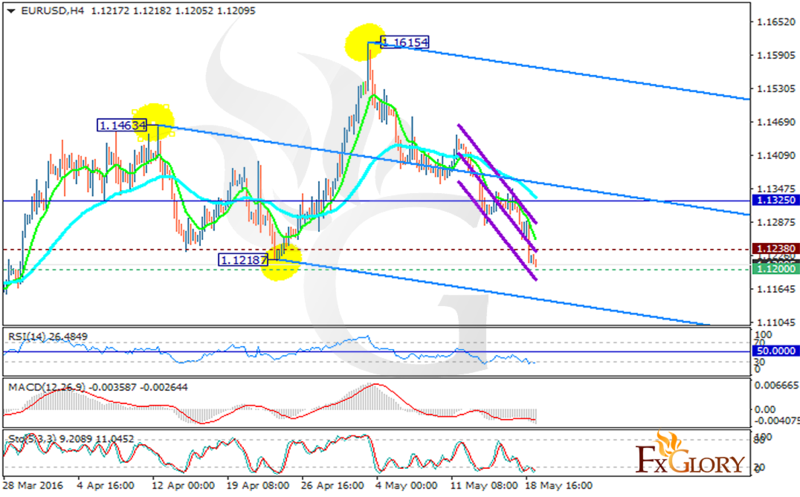 EURUSD will be under the influence of CPI report for April. The pair is finding support at 1.12000 with resistance at 1.12380 which both lines are below the weekly pivot point at 1.13250. EURUSD is falling down the descendant channel within Andrews’ pitchfork. The EMA of 10 is located below the EMA of 50 suggesting the price decline over the last 10 days. All indicators are showing price fall; MACD indicator is in negative territory, the RSI is below the 50 level and the Stochastic is confirming this bearish scenario. It seems that buyers cannot take profit of this pair at the moment, short positions are recommended with the target at 1.0821.